Wind: Stupid strong headwind all day long. 20 mph west wind. Incessant. 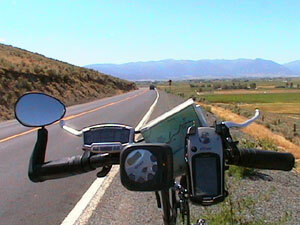 Weather: 55°F (13°C) in the morning; got up to 82°F (28°C) by end of ride at 3:30pm. Clear with brilliant sunshine. Wind is bad. Very bad. It was windy all night last night and into the morning. I faced a very, very stiff headwind right away and it pushed against me all day long. This is one day that recumbents make a big difference. My riding partner, Joe, took much longer to reach our break points today on his mountain bike. Recumbents are certainly more aerodynamic than uprights. Add to that a 32 mile uphill run and it makes life just miserable. My average speed today was just 8.9 miles per hour which is the second lowest of the entire trip. The lowest average speed was 8.8 miles per hour when I rode from Canon City to Hartsell, Colorado on day 34 when the net elevation gain for the day was 2596 feet, by far the greatest net gain in elevation for the route. There are wildfires here in Oregon that are still burning intensely. One of them is along an alternate section of our route. 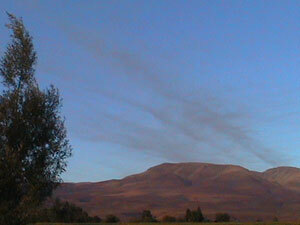 The picture to the right shows smoke in the early morning sky. The only stop along the route is Keith Martin's house where he has a soda machine and a porch to sit on. He moved here in 1981 and had some TransAm cyclists stop by regularly for water. Since he realized that he might not be home when thirsty cyclists stop by so he installed a soda machine out front. 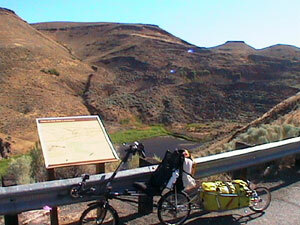 We had a nice conversation and then headed on against the wind toward Baker City. The route closely followed the Powder River for most of the day. In 1982 a large landslide overtook route 86 and part of the river. Local residents were stranded for some time and it took two years before the highway was relocated. The first shot shows the location of the landslide which still moves 1/2 inch per day to this date. The second shows the old highway and its terminus. 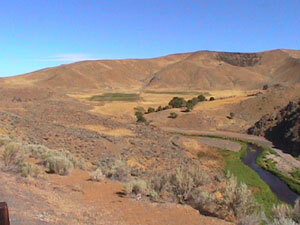 Note how lush the vegetation is along the river in contrast to the dry sagebrush of the surrounding land. 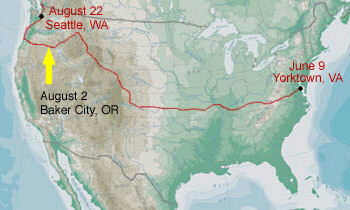 The National Historic Oregon Trail Interpretive Center is about eight miles east of town on Flagstaff Hill. I had intended on going there but saw that it is located on a hill about 700 feet above the road. Here is a picture of my bike at the sign. 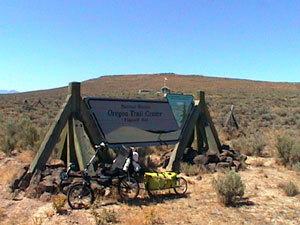 The visitor center is barely visible above the sign on top of the hill. Just after passing the interpretive center I reached the top of Flagstaff Hill, the peak for the day. Here are some shots from the top. 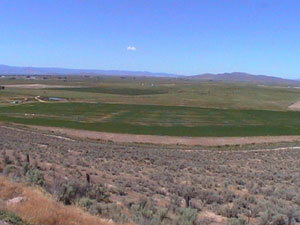 View into the valley where Baker City sits. A look down the hill from my point of view. My left pedal has been making an annoying clicking sound for the past few days. The bearings in the spindle gave out. I bought some new pedals in Baker City at a bike shop. They didn't really have SPD pedals in stock so the owner took them off a bike that he has been trying to sell. The pedals cost $60 and the bike was only $500 and an excellent deal. I was temped to buy the whole thing. The bike was an aluminum Specialized touring bike with straight handlebars and all the bosses for cages and racks. It's worth about $800 but he got one on a factory clearance. It's too bad he didn't have such a great deal on a mountain bike because I would really have been tempted. My GPS only has Baker, Oregon rather than Baker City, Oregon. I also noticed that the road signs sometimes say Baker and other times say Baker City. It turns out that the original name of the town was Baker City but was later changed to Baker. There has been a push recently to go back to Baker City as the town restores itself to a more historic past. There are tons of intersections in town that have no stop signs on any corner! I could hardly believe it and people nearly hit each other all the time. Joe just about got nailed once. I suppose people who live here know to drive slowly but others would have no clue and risk getting hit. Joe and I went to see Signs today at the theater here in Baker City. It is a pretty freaky thriller movie with Mel Gibson. It was very well made but just a little too horror for my liking. I also got a hair cut today - my first one in two months.